Fillmore, CA: A 30-year-old off-duty deputy sheriff crashed his SUV into a Los Angeles-area Starbucks last night after he apparently fell asleep at the wheel, killing Sergio Mendez, a 30-year-old Iraq war veteran who was pinned between the vehicle and an internal wall in the Starbucks. 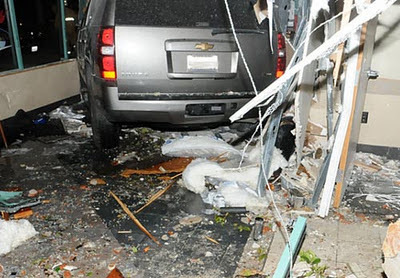 Two other Starbucks patrons were injured during the crash, though neither seriously, according to ABC News. The vehicle's impact was reportedly so strong that officials had to red-tag the building.